Cool days and cold nights make us think about more substantial food for dinner. And it doesn't have to be bad weather that makes you crave comfort; everybody needs help when world events or personal problems are overwhelming. This is the perfect time for a look at comfort food recipes we crave. There is a common thread that runs through all the wonderful recipe choices - they are delicious and easy to make. Comfort foods are usually a food from childhood that evokes memories of being warm and cozy and cared for by someone special. Try these recipes and you and your family will feel cozy and safe too. These are some of my special versions of popular comfort foods recipes. Join us in the forum and tell us about your favorites too! 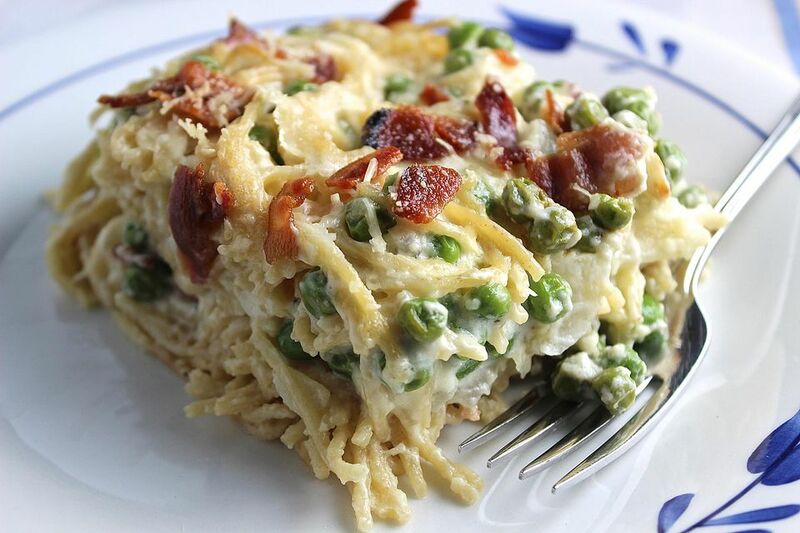 This wonderful recipe is made of a creamy cheese sauce that envelops spaghetti, bacon, onions, garlic, and peas. It melts in your mouth. For true comfort food in a hurry, this recipe is hard to beat. It really is the fastest cheesecake - ever! There's really nothing comforting about standing next to the stove making sandwich after sandwich. So this oven method, which produces perfectly melted cheese and crisp bread, is a real winner! Go sip some hot cocoa while they bake. This wonderful five ingredient recipe is super fast, rich and creamy. Salsa and four cheese Alfredo sauce combine for a creamy, spicy, and warming topping to tender chicken and perfectly cooked pasta. Avocados add the quintessential finishing touch. Since the pasta cooks right in the sauce, it absorbs a lot of flavor. I also love the texture of the spaghetti when it's cooked in this fashion. I discovered the secret ingredient to the special tang that take-out pizzas have, and I make my pizza sauce this way every time. This super-easy recipe uses refrigerated dough for a quick treat. Everybody has their own special chili recipe. I love this one, made in a crockpot. Two ingredients plus a microwave oven equals some of the best fudge you'll ever eat. This rich and creamy, chewy, and crisp no bake bars are true comfort food. This recipe for green enchiliadas is one of my favorites. The smooth cheesy sauce, tender chicken, and lots of green peppers and onions make it so flavorful. This easy slow cooker recipe is not only comforting, but it's 'good for what ails you', as my dad says. If you serve this with lots of great bread and vegetables, it can be dinner! The secret to great meringue that doesn't get watery is in this recipe. Okay, so this doesn't use arborio rice, so it technically isn't a traditional risotto. I love it anyway!